Artist Holly Wayne with "Nova at Dusk"
Holly Wayne combines cultural artifacts with a luminescent resin, Metalar™*, to produce images that conjure the past. 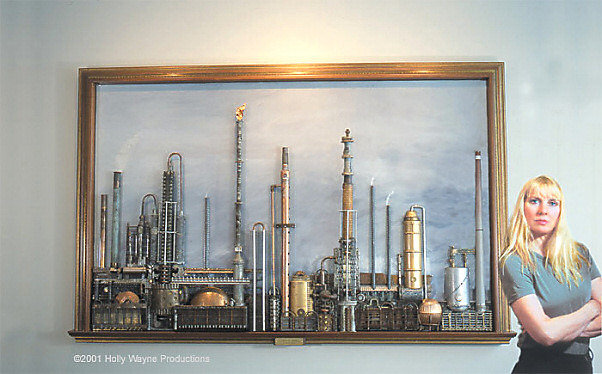 The alchemy of her medium transforms diverse materials such as farm implements, scientific instruments, kitchen gadgets and machine parts from factories into three-dimensional montages that engage the viewer in a celebration of America’s industrial legacy. ....more than the sum of its parts. Bloomingdale's Gala 90th year Celebration. Photo not retouched! Metalar™ is easily the most dazzling surface treatment available. 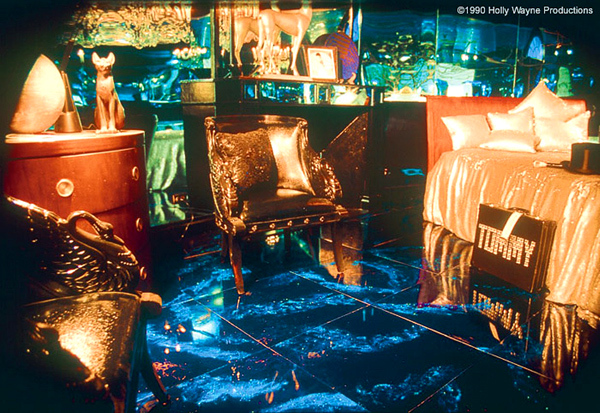 Created by Holly Wayne Productions, its depth and brilliance redefine conventional surfaces, conjuring up the passion of fine gems and the drama of marble. Each Metalar™ panel is a handmade work of art which can be customized to meet exact specifications. *Metalar™ is a unique proprietary material developed by Holly Wayne in 1987 for applications in the visual merchandise and store display industry. Partial Clients include: Chrysler Corporation (Detroit Auto Show), Bloomingdale’s Model Rooms (New York City), Figali Department Store (Panama), Accente Retail Stores (Scottsdale, Atlanta), Temple Sinai Synagogue (Pittsburgh, PA), Nova Chemicals (Pittsburgh & Abu Dhabi).